Katsushika Traditional Craftwork Museum (葛飾区伝統産業館,Katsushika-ku Dento Sangyo kan.) is a correct shop of craftworks made by Traditional craftmen of Katsushika. There are 45 members of Claftmen registered in this museum. 25 of them display and sale their claftworks at here. Each claftmen bring their unique and traditional craftworks here for sale. Every 3rd Saturday, we have experiencing claftwroks. Contact MLJ for making reservation. Edo Wasao (Edo style fishing pole): Hand made fishing pole made from bamboo. This fishing pole started during Edo period. During Edo period, fishing was one of the most popular hobby for Samurai. Edo Oshie Hagoita: The history of Hagoita starts since Muromachi era (1432). During the Edo period, hand made doll attached Hagoita became very popular. Edo Ishogi Ningyo (Kimono Dolls): It's a doll with Kimono. Hina dolls, Musha dolls and Ichimatsu dolls are categorized as Ishogi Ningyo. During Edo period, many doll designers became Samurai and taught their technique all over Japan. Edo Katabori (Edo Style Screen Printing) This is Japanese style screen printing for clothing. It was invented in Muromachi era. During the Edo period, its technology improved and be able to provide much detailed images on clothing. Edo Kiriko (Edo style Glass Carving) : Edo Kiriko is a glass carving arts which becomes popular in 1834. In Meiji era, the techniques took European style. Edo Uchi Hamono (Edo Sword Smith): They are used to be Sword smith who makes Katana. 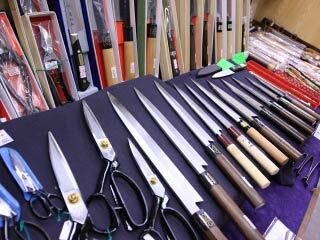 After the end of Edo period, they used the techniques of Sword making for Hocho, Japanese style kitchen knife, scissors, and carving knife. Dosei Oroshigane (Capper craftworks): Capper was used in Japan for over 4 thousand years. During Edo period, a grater of capper and pans were become very popular because capper has flat conduction of heat, unlike iron. It's great for cooking eggs. Tokyo Gingi (Tokyo Sliver Craftworks): Silver works is one of the oldest craftworks in Japan. It developed greatly in Edo period. Mr. Yokoha (1670 to 1733), opened his technique of silver craftworks to citizens, many craftmen started designed for them. Currently, some of the works are provided to the imperial family. Ise Katagami (Ise Style Screen Printing): This is the traditional screen printing of Ise. It was used for printing Japanese clothing. During the Edo period, screen printing were permitted to citizens, it became very popular. Edo Mokucho (Edo Wooden Carving): Wooden Carving exists since Heian Era especially at temples. Today, those craftmen still provide their art to the shrines and temples. They are mostly used for Mikoshi, gate and other decorations. Tokyo Butsudan (Tokyo Buddhism Chamber) : Butsudan became very important during Edo period, because all Japanese must belong to one of temple. Butsudan is one of the few things that citizen could have something gorgeous, so all people wanted to have a great design for it. Takezaiku (Bamboo craftworks): Bamboo craftworks are most common craftworks in Japan. The craftworks are carried over 100 years of techniques. Tawashi: Tawashi is one of the most brilliant invention during Meiji ear. Tawashi is one of the best scrub brush in the world. Tokyo Tegaki Usen (Tokyo hand written art): is Edo style hand written art. It was invented by Yuzensai of Kyoto in 17th century. He had many students at that time. Today, his style are still succeeded to our generations. Kraki Zaiku: is an old chinese style wooden works. It appears in the record of Heian era. It has great chopsticks. Bekko (a turtle shell): is also one of the oldest craftworks in Japan. In early Edo period, Edo Bekko Style was invented and its craftworks became very popular. It was very popular for combs, Japanese hairpin, and all other accessories.